Saint Michael is the Archangel, the Supreme Commander of the Heavenly Hosts, Heaven's security forces. 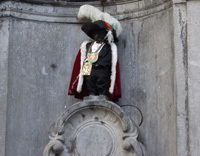 He is also the patron saint of Brussels and of the fencers and knights. The roots of the Corporation of the Knights of St. Michael go back to long forgotten times when there still were dragons to be slain and maidens to be rescued. On the official flag of the Corporation we see the year 1480. We swiftly gallop forward to pre-modern times, before the personal computer, 20 November 1974 to be precise, when a not for profit association was founded for the Corporation. One of the objectives of the Corporation is the collaboration of its members for the defense and promotion of their moral, social, cultural and material interests. 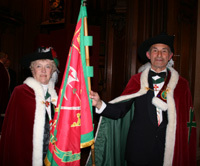 In 1977 the Burgomaster of Brussels, Mr. Van Halteren officially conferred upon the Corporation the titel of "Serment de St. Michel de Bruxelles", the Oath of St. Michael of Brussels and entrusted them with its flag and coat of arms. Twenty years later, in January 1997 the Saint Sebastian Guild of Westerloo let it be known that the descendants of their founder, the Prince de Mérode owned a preciously garded ancient flag of the "Serment" and that they wished to return it to the Corporation of the Knights of St. Michael. And it was handed over during the Chapter meeting of the Corporation on 29 September 1997 in the Gothic Hall of the Brussels City Hall by Prince Alexander de Mérode. This flag, two meters square, with its silk embroidery, is far too precious and too frail to be used in the Ceremonies of the Corporation. Besides, it awaits a rather costly restoration for which the Corporation soon hopes to find the sponsors. The activities of the members are given free of charge. The satisfaction and recognition they get in return is invaluable. For many years its carnival section, the Corporation of the Dragon organized a carnival for the grownups and another for the children. The Chancellery of the Corporation of the Knights of St. Michael is at Grand-Place 11, Brussels. Brussels' very first Christmas Market in the Place du Sablon (Zavelplein) saw the creation of the Corporation's Gastronomical Section that swore to promote something typically "Bruxellois", the Pain à la Grecque. "Bruut van de grecht", litterally "bread from the ditch" was first made in a bakery of a religious community situated in the Wolvengracht, Fossé-aux-Loups, Wolves' Ditch. In the 16th Century this street ran east from the Senne River all the way to the city walls. Along came a French army, one of the many occupation forces quartering soldiers on the civilians, and they were the ones who came up with this rather marvelous translation. And you can image how gleefully the locals took to this new name for this now exotic pastry. It is not known when this religious order settled down here or when they first made their Pain à la Grecque. Perhaps an apprentice rolled some dough in big sugar crystals. No one now knows how this new delicacy was discovered by other bakers and how the recipe was then copied (of course without paying... royalties, a revolutionary idea whose day was quite a long way off yet). One thing is easy to understand though: the success pain à la grecque has enjoyed ever since. Especially when it's really well made like by the great House of Dandoy, one of the longterm sponsors of the Corporation. The Biscuiterie Dandoy is not exactly a one day stand: it was established in 1829. They still make the same delicious biscuits, cookies and the Brussels specialty of "Pain à la Grecque" and they still make them by hand. I will tell you no more about the Biscuiterie Dandoy because they have a really great, professional website almost as delicious as their cookies, and as beautiful as ye olde shoppe in the Rue au Beurre. Come and see for yourself and get some cookies for all those near and dear to you. Or order via their website: click here. It's in English.